As a companion note to my previous blog on Sandusky Ohio, I wanted to share another site that I found regarding the Ohio Veterans Home Cemetery. 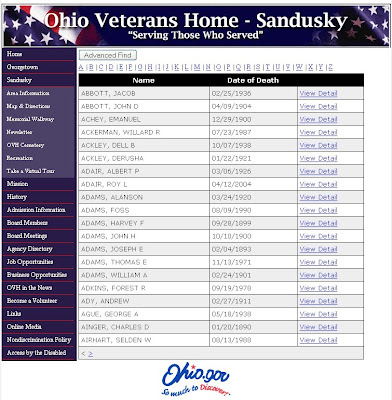 The Ohio Veterans Home Cemetery Database is organized to allow searching with ease. You can alpha browse or perform an advanced search for a particular surname at this website. The cemetery website not only provides the vital record information, but also provides you with a picture of the grave marker. If you are interested in searching the Ohio Veterans Cemetery Database, please click here to begin your search on the first page. Have fun!